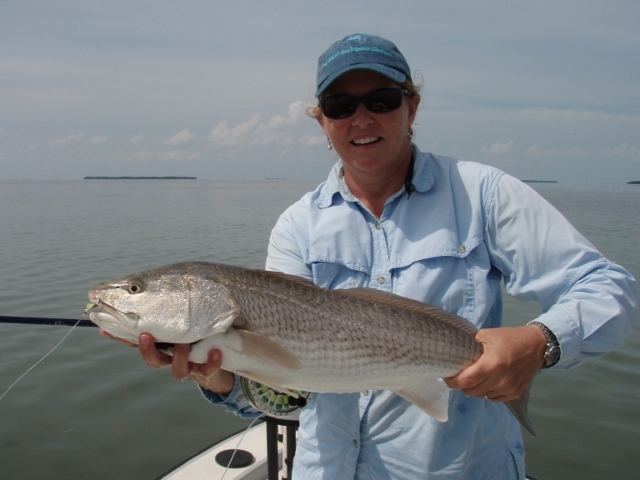 Red drum or redfish are another cool fly fishing target. They can be easy as pie or tough as nails to catch depending on the conditions and the fishes' mood. If you come to Miami fly fishing and want to target reds, we will fish for them in Everglades National Park (ENP). They average about 23” and a large one in the Park is about 33 inches or about 11lbs. The really huge fish can be found on the offshore wrecks around March. Most baiters catch them in channels at low tide. Not my game. In the UK, Trout Fisherman magazine featured an article by Paul Proctor entitled "Redfish Tails on the Flats," (a link to a PDF copy of the article is available here). Some of the article discusses fishing techniques we employed in Florida Bay on his visit here with John Machin of of www.flyfishflorida.co.uk and Photographer Rod Calbrade who took some great photos. Fishing with these guys was a pleasure - all are excellent fly casters. At times, both in the backcountry and Florida Bay sides of the Park and are fished a little different depending on the location. Click below for more information on each option. For more information or to set up a Miami fly fishing trip or an Everglades National Park fly fishing trip, email me: dave@hunttheflats.com. Due to the inordinate amount of robocalls I receive, I no longer accept phone calls. Copyright 2018 Dave Hunt.